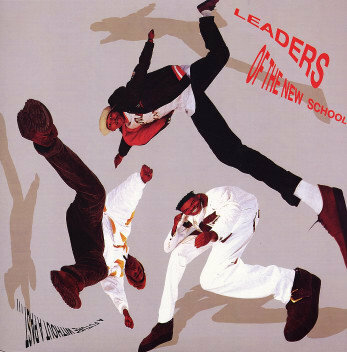 Long before Busta Rhymes was the emcee of some day-glo Zulu night club, he was in Leaders of the New School. The group consisted of three proteges of Public Enemy’s Chuck D: Dinco D, Busta Rhymes, and Charlie Brown, and their DJ, Cut Monitor Milo. They took their name from PE’s “Don’t Believe the Hype” (“Leader of the new school, uncool / never played the fool, just made the rules”), and Busta was christened as such by Chuck himself, but that’s about where the similarities end. Far from PE’s incendiary blasts, LONS’s 1991 debut album A Future without a Past can best be described as charming. The rappers are young, each all of 19 years old, and Future is a rough concept album about being in high school. Despite their ages, though, their rhyme styles here are well-defined: Charlie B dive bombing to a Chuck D baritone and then shrieking; Bussa Bus adopting his hoarse reggae flow with a thick New York accent; Dinco D with his nasal stutter. Milo’s beats are high energy, joyous, and layered with melodic and recognizable loops; likewise, the three MCs reference everything from PE to Burt Bacharach. They are obviously consummate music lovers and make the most of it; the record is a joy if only to pick out all the samples and references. Their second album and swan song, 1993’s T.I.M.E. – The Inner Mind’s Eye, does a 180. The beats become streamlined and dry, reminiscent of the insistent snare thwacks that had come to characterize Q Tip’s production. Likewise, the three boys adopt the much of Tip’s interest in vague, weed-hazed metaphysics, as evidenced by the titular reference to the Taoist “Third Eye.” (Gone are references to detention, spit balls, cars and girls.) The rhymes still show consistent brilliance though, and the beats still stomp, and while TIME is the headphones album to Future‘s party jams, LONS prove themselves to have grown considerably between the records. Alas, it is about this time that Busta unites with Flip Mode and becomes too big for LONS’s breeches. Since their 1993 breakup, Dinco D and Busta Rhymes have traded public insults; most recently, Dinco told HHN of Busta, “Lyrically, I’ll eat him,” presumably responding to a recent report that Busta had called Dinco a doofus or some such nonsense. (In other words, don’t hold out for a reunion.) Dinco dropped a solo album last year, and we all know what Busta Rhymes is doing these days: dropping flaccid verses on Pussycat Dolls tracks. What Charlie Brown is doing, no one knows. Too bad; he was my favorite Leader. The Canon, Examined is a weekly series spotlighting the finest records to ever slip through the cracks. For previous installments, click below.